Truth be told, the Iran deal has caused significant angst not just in the United States. It has done the same in Saudi Arabia. In both countries it has surfaced differences that had seemingly been submerged in the interests of political and geostrategic expediency. Significant numbers of Americans continue to second-guess Saudi Arabia’s commitment to fighting al-Qaeda, Da’esh, and similar groups of extremist violence. Significant numbers of Saudi Arabians continue to question the efficacy of the American policies vis-à-vis its invasion and occupation of Iraq, not to mention Washington’s contributions to the Palestine conflict earlier and its prolongation to this day that have contributed to the origins of al-Qaeda, Da’esh, and similar violent groups. The nature, extent, and consequences of America’s commitment to Israel understandably remain a point of contention. At the same time, some have called into question one of the traditional underpinnings of the relationship, namely Saudi Arabia’s role as the “swing” if not dominant international oil producer. Underlying these and other issues is a Saudi Arabian concern about succession after President Obama as well as American concern about succession after King Salman. One of the strongest aspects of the relationship between the kingdom and the United States currently is the ongoing twofold cooperation between the countries in the defense and security fields. This is now at its zenith. For the first time, the United States and Saudi Arabia are jointly prosecuting two conflicts simultaneously. The kingdom’s superior knowledge and understanding of the internecine dynamics of Yemen’s governmental structures and systems of political dynamics, combined with its and the UAE Special Forces’ expertise, is in a category unto itself. Combined with it has been and continues to be American military equipment, expertise, logistic, and intelligence support. The efforts of both sides are proving essential to the campaign to restore Yemen’s legitimate government. A Royal Saudi Air Force F-15 taking part in Operation Decisive Storm. Photo: Saudi Press Agency. Simultaneously, the Royal Saudi Air Force’s support and participation in the internationally concerted anti-Islamic State group operations in Syria and Iraq have provided an invaluable military contribution. To be sure, neither the Yemen nor the anti-Islamic State group campaign is likely to achieve its political aims in the near future. A reason is that the two campaigns are marked by a reliance on air power more suitable for limited operations aimed at inducing a political outcome than of the tactics being employed by the Houthi and Da’esh militants, neither of which has shown any inclination towards surrender. As a consequence, the campaigns may be approaching the point where airpower will have run the length of its utility. King Salman and his American interlocutors, President Obama included, cannot help but acknowledge that Saudi Arabia’s air force has performed well in the Yemen campaign. At the same time, however, both remain aware that reliance upon air power alone against a determined enemy is unlikely to prevail. As NATO learned in Kosovo, air power has its limits. The king and the president accordingly can be expected to discuss how the Saudi Arabian-led coalition, together with America’s assistance, can help bring operations in Yemen to a satisfactory conclusion. Yemen is one thing. Syria is another. President Obama, for his part, can be expected to seek support from the Saudi Arabian leader on his policy aims in Iraq and Syria. Likewise, King Salman can count on meeting an American president who is willing to listen and benefit from what he and his officialdom have to offer in this regard. No one outside the White House can claim to know exactly what questions will be put to the Saudi Arabian head of state, or vice versa. Even so, it is fair to assume that the president will seek to learn to what extent Riyadh would be willing to support this or that Syrian opposition movement, on one hand, and the efforts of the Iraqi government against Da’esh in Iraq’s Anbar Province and elsewhere. Obama will be understood if, in his quest to prevent an open Sunni-Shi’a war in Iraq, he were to view cooperation of the strongest Sunni state as an important if not vital key. In the overall scheme of things, whether news of a significant weapons sale is a result of the meeting ought to be neither here nor there. In this regard, and contrary to popular media-anchored belief, the dynamics of arms sales are not synonymous with the success or failure of America pitching the purchase of its weapons to a client. Americans ought to be aware, but the evidence as yet is that the number who know is very few, that whenever any country requests to buy a range of American defense equipment, the United States is required by law to enter into a prolonged review as to whether the item in question ought to be released for purchase by other countries. In the United States, albeit not in other countries, such a review includes an analysis of the effect that a given proposed sale of American armaments to another country might have on Israel’s qualitative military edge towards all 22 Arab countries combined. Yet this meeting could still well see announcement of the sale of the American-manufactured Theater High Altitude Air Defense system to enhance the Kingdom’s Patriot Air Defense System. A joint declaration on missile defense, increasingly a much-preferred avenue for joint U.S.-Gulf Cooperation Council (GCC) – comprised of Bahrain, Kuwait, Oman, Qatar, Saudi Arabia, and the UAE – defense cooperation, is also possible. The success or failure of President Obama and King Salman’s meeting is unlikely to turn on arms purchases and sales. Rather, it is likely to be dependent on, more than any other issue, their discussions surrounding the United Nations Security Council’s five permanent members’ (China, France, Russia, the United Kingdom, and the United States) plus Germany’s (the P5+1) nuclear deal with Iran. Saudi Arabia is not alone in having questions about the deal. Most of its fellow members of the GCC also have questions. For reasons owing to an extraordinary number of meetings, visiting, and briefings between the two sides’ leaders within the past year, however, the questions are in nature and extent far fewer of late than they were in the years and months earlier when less information and insight was available. 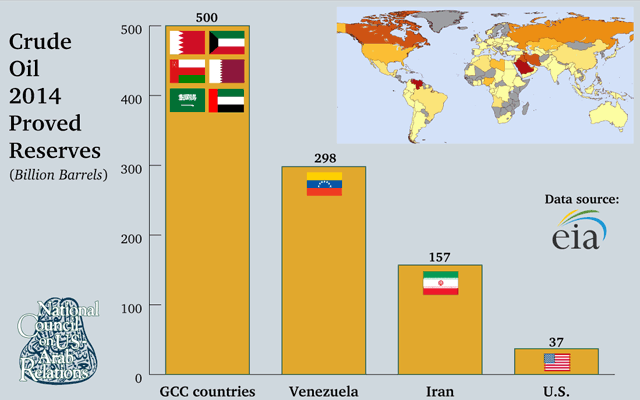 This said, the GCC is on record as being in support of the deal. U.S. President Barack Obama hosted leaders of the Gulf Cooperation Council for a summit meeting at Camp David in Maryland, USA, on May 14, 2015. Photo: Saudi Press Agency. Even so, just as the United States Executive Branch of government has to contend with a public that is relatively little or poorly informed on innumerable international issues of importance to its perceived interests, the same is true for Saudi Arabia and many another countries. Hence, in an echo of the many corners within the American private sector that claim the Obama Administration has done less than it could to reach an agreement likely to advance regional and global peace, security, stability, and the prospects for prosperity, so too is there a similar element at work within Saudi Arabia and the other GCC societies. This is not the place to point out how ill-informed remain key elements of American and Arabian societies with regard to an important international issue that has been front and center for a decade or longer. Nor is it the moment to illustrate how half a dozen other major ones within the past year have dealt with the exact same issues as this one regarding the fear of some that the United States is on the verge of swapping Arabian chess pieces for Persian ones. To state that some Saudi Arabians view U.S.-Iran relations as a zero-sum game – that an improvement in American relations with Iran will come at the expense of the relationship with Saudi Arabia and the other GCC states – is baloney ought to be, but apparently is not, sufficient to quiet the professional naysayers. It is not as though this parody of affected disbelief in the head of state of the world’s most militarily, technologically, economically, and financially powerful country’s ability to conclude an agreement not injurious to American and allied countries’ national interests has not previously occurred. It has. Even so, President Obama’s work will once more – for the umpteenth time – be cut out for him. The President and his White House staff will have the technical task to explain how the deal will enhance peace, security, and stability for the Gulf as a whole. Their arguments will simultaneously not be able to paper over the record of cultural and related misunderstanding rooted in each other’s policies, positions, and actions. A grace note in underscoring how much they do in fact understand one another and have in common in terms of needs and interests would be for both to remind and underscore for the media, the U.S. Congress, and various lobbies opposed to the deal that this year marks the 70th anniversary of two of America’s and Saudi Arabia’s joint anniversaries. In one, on February 14, 1945, Saudi Arabian King Abdulaziz bin Abdul Rahman Al Sa’ud and U.S. President Franklin Delano Roosevelt met aboard the U.S.S. Quincy in the middle of the Suez Canal. 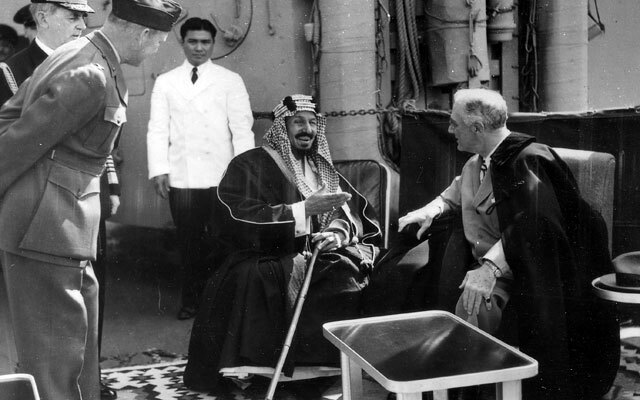 President Franklin Delano Roosevelt met King Abdulaziz bin Abdul Rahman Al Sa’ud aboard the U.S.S. Quincy in the Great Bitter Lake in Egypt on February 14, 1945. Photo: U.S. National Archives and Records Administration. In so doing, they thereby signaled the strong national and personal bonds between the two countries’ leaders that have served each other’s peoples – and arguably the world, too, – well ever since. Regarding the second event, the two countries’ leaders stood side by side with one another as their respective foreign ministers co-founded in the United States the world’s highest political body, the United Nations, also in 1945. King Salman arrives in Washington in 2015 not without leverage in discussing how Saudi Arabians understand geography and that their interests in the Iran deal are more significant than those of the United States. Nor will he be without a voluminous file of evidence portraying Iran’s persistent record of meddling in what he and his fellow Arab heads of state regard as quintessential Arab affairs. There are other givens. A fundamental one is that the king’s foreign minister, the exceptionally politically savvy Adel A. Al-Jubeir, was until recently the Saudi Arabian Ambassador in Washington. More than many others, he is well placed to indicate the implications of the domestic American argument over the Iran deal. The kingdom’s foreign minister is also well situated to place in context how various American observers of international politics have been hoodwinked into believing that Saudi Arabia and the Prime Minister of Israel are joined at the hip in their opposition to the Iran deal. 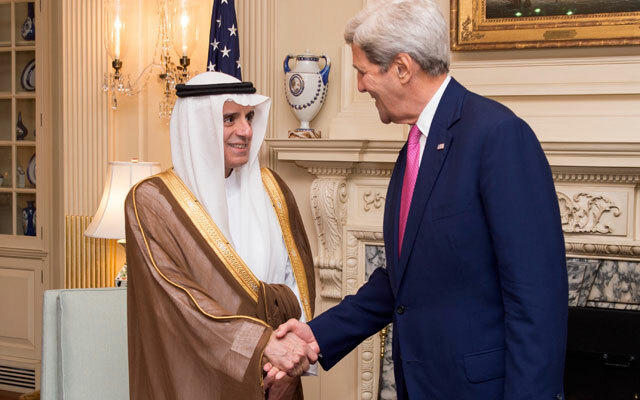 U.S. Secretary of State John Kerry greets Saudi Arabian Foreign Minister Adel al-Jubeir before their meeting at the U.S. Department of State in Washington, DC, on September 2, 2015. Photo: U.S. Department of State. Despite the obstacles, to envision that the President will be unable to summon all of his formidable charm and powers of argument to continue to persuade Saudi Arabia of the value of the negotiated Iran agreement would be to underestimate the head of the American presidency. An additional stress on the analytics of the U.S.-Saudi Arabian relationship is the financial challenges confronting both sides. Saudi Arabians are rightly concerned that the American commitment to the Gulf region’s stability may wane in the wake of diminished U.S. Defense budgets. So, too, are Americans concerned about the impact of low oil prices on Saudi Arabia. The consequences of U.S. budget sequestration – hardly a new reality or phenomenon but, rather, one with which policymakers have had no choice but to grapple for the past half-decade – are yet to be seen. That said, it is more likely than not that the U.S. defense budget will continue to be cut disproportionately to other budget items. That the United States no longer has an aircraft carrier constantly in the Gulf has been noted throughout the region, together with the implications for regional needs and policies of possible further American defense budget shrinkage. President Obama’s burden will be to show how the U.S. commitment will remain constant even if the American “big ticket” defense presence, if measured in terms of sheer physical military might, is not. Conversely, Americans might have concerns about the future of Saudi Arabia’s finances if oil prices continue at their current lows. Riyadh is heavily reliant on oil to fund its extensive defense and security structures and systems as well as its social welfare programs. The kingdom’s private non-oil industry, while booming and likely to continue to be robust, is yet to be developed to a level that can be sustained in the absence of a strong oil economy. In this context, the President will welcome insight as to how the Kingdom plans to manage this period of low oil prices, especially as there is every indication that it will be extended and deepened once Iranian oil hits the global market. Both leaders might also be concerned about what will come after their personal head of state partner is gone. In so doing, they would not be without reason. King Salman may be worried that a new American president will choose not to honor commitments made by his predecessors. The election season in America rarely brings much comfort to Saudi Arabia. This is understandable. Indeed, the kingdom’s concerns are generally not viewed with the same sympathy as American voters view those of Canada, Mexico, Israel, Europe, or Japan. President Obama must do what he can to reassure King Salman that his existing undertakings, in addition to whatever understandings the two may agree to this week, will be honored by his successor. Conversely, President Obama may be concerned about the future of Saudi Arabian leadership in light of recent changes made to the line of succession that put King Salman’s son in the position of Deputy Crown Prince and thus may have raised questions among other branches of the family. The robustness of Saudi Arabia’s royal family, however, is generally underestimated in America and the West. In the lifetime of this writer, one Saudi Arabian monarch has been deposed or disposed to abdicate. Another has been murdered. In both instances, no chaos ensued. Nevertheless, mutual considerations of future leaders will be in the background. The American–Saudi Arabian relationship is a strong one. That the leaders of both nations are meeting at a time of regional turmoil is indicative of this strength. Both nations have roughly the same objectives in this meeting. The challenges will be to go beyond understanding each other’s perceptions – this, to a degree, they already do – and find policy courses most likely to achieve mutually beneficial aims. The public announcements after the meeting, to be sure, will be parsed and analyzed. Yet, from the perspective of analysts and those tasked with assessing the results, they are but trees in the forest. The greater message is that the king and the president are meeting as peers. They are doing so not to pass the time of day. They are doing so to resolve issues of mutual concern. The partnership between the two countries – and the partnership between any other two countries – can be strengthened only in this way. The takeaway? Don’t believe the hype. The relationship is one for the long-term. This entry was posted in Iran, ISIS, John Duke Anthony, Saudi Arabia, Syria, US-Arab Relations, Yemen.